We work with a handpicked group of local companies with lots of expertise and experience to bring you the best safari tours that are available on Lanzarote. Pick up from Playa Blanca, Puerto del Carmen, Costa Teguise. Enjoy the coastal view of Puerto del Carmen and Arrecife. See the native villages in Haria. Professional Drivers & Jeeps Visit Fuerteventura while on Lanzarote! 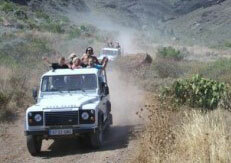 Copyright © 2013 - 2019 LanzaroteJeepSafari.com is a Gran Canaria Boat Trips company.